I am tearing my hair out. Or I will, as soon as I can figure out where the task is to do that and who’s responsible. We have a team of 7 staff members. Each of us works on different projects for different programs. From time to time, we work with consultants or outside vendors. We are an efficient bunch, but what we lack is centralized project and task coordination. We need to be able to see how our projects are progressing over time. Where the bottlenecks are. What is falling behind. What the next year will look like for projects we know we’re going to take on but haven’t started yet. Folks are comfortable in email and instant messenger. It’s where most of the conversation happens between us and we get a lot accomplished. Yet working this way, we miss that “big picture” overview. It seems obvious that there should be a tool we can use to help us here. We don’t have a server so we don’t want desktop software. We want something that works in the cloud. You would think that with so many choices we’d find exactly what we need. I have spent the last week or two trying more of these online project management tools than I can count. Many of them are here. So frustrated that none are singing to me the way Salesforce or Google Apps did when I first tried them out. Uncluttered interface – folks have to spend less time managing projects than doing them. It doesn’t have to be simple or designed for idiots – I work with very smart, technically capable people. It needs to be streamlined and without features and distractions we don’t need. A task management system folks will actually use – When they finish a task, will they remember to go to this tool and check it off? Don’t want tickets/case management, don’t want wikis, don’t want blogs, don’t want “here’s what I’m eating for lunch” status updates – need to be able to to tailor interface to only what we need/want. We have other tools, I want to avoid duplication as much as possible. Cost: total of under $50 per month but can make a case for spending more if it’s exceptional. What follows is my impression of what I’ve tried so far and why it falls short. The biggest problem with these tools is that they are designed for teams that work with clients. Or they are designed for teams that work on software development. Or they are designed for teams that work work with clients on software development. What about project management for teams that produce newsletters? For teams that are working on a conference or event? For teams that are tracking a year-long editorial and strategy calendar for fundraising campaigns? Not so much. I’ve been whining about this in Twitter a bit. I’ve been asked to summarize my findings. These are the tools I’ve evaluated/looked at and why I like them/don’t like them. Who hasn’t looked at Basecamp? It’s the tool that others are measured against in this space (online project management for small teams). I like the interface, but I don’t like a tool that believes that all you need to do to make it yours (as they say on the tour page) is to upload a logo and change the color scheme. The Dashboard view is all about the “latest activity.” I don’t care so much about what has already been done on a granular level. I care more about what has to happen next. I care whether other people on my team have taken care of what they need to do that moves a project forward, not on the chatter in the message view. The “latest activity” dashboard view is noisy and not incredibly useful, and there is no way to customize that experience. The milestone calendar doesn’t tell me what I really need to do, other than a milestone exists. There is no Gantt view that combines milestones and tasks. Finally, there is no way to clone a project. We put out a quarterly newsletter. I do not want to recreate all those tasks and milestones for every issue. Basecamp’s focus is on collaboration. Wonderful. But I need a tool that’s more about action than discussion. This one showed promise. They have nonprofit discounts which would have made the cost a very doable $20/month or so. But I don’t think it will work for us. One advantage it has over Basecamp right out of the gate is a timeline view. But it’s clunky. Instead of listing the tasks on the left with bars across the dates, 5 pm put the task names right in the interface. That makes it difficult to tell what you’re looking at. There is no bird’s eye view for an organization. Each user has their own 5pm account and can add colleagues to projects. And like Basecamp, the dashboard focuses on completed project activity rather than telling the user exactly where their focus needs to be to get things done on a project. I’m Bill and I just logged in to the above 5pm dashboard. What’s the next thing on my plate? I have no clue, but it’s nice to know that we’re done with our business cards or that a file was uploaded 4 days ago. Is it a file that has something to do with a task that I need to complete? I’m not sure. But let me jump on the conversation about it anyway. Ugh. GoPlan, Huddle, DeskAway, CentralDesktop, etc. etc. etc. etc. All of these look and feel a lot like Basecamp. Once again, focus on the dashboard is on recent activity and not the next action or current progression of the project. Is the point of these things really just so we can show that we’re looking busy? Calendar views show today’s date (gee, thanks…needed you tell me that) and where milestones are pre-set. Nothing about what still needs to be done to complete the tasks leading to that milestone. I have to jump around to different views for that. I’m not looking for Microsoft Project, but I still have to focus on moving along a timed path. Not just getting everyone in a conversation. If a task slips for whatever reason, then tasks expected to happen afterwards but before the milestone have to be adjusted. I am not going to change the date of our event. I am not going to change the date an issue goes to the printer unless there is absolutely no other option. So tell me what we still need to do and how fast to make sure we’re ready for each milestone so we can reach the end of our project. Which tasks are dependent on others, so we can figure out who and/or what is holding up a project? Most of these have integrated tickets/cases for dealing with issues. Good for software development projects. Not so good for nonprofits that are working towards completing an editorial or event project by a given date. I want to plan and adjust to circumstances, not just react. I’m annoyed by tools that ask for “status updates” a la Twitter as a feature. We already have Twitter, Facebook and now Salesforce Chatter. How does telling other folks what I’m doing help us evaluate the progression of the project? I don’t get it. Adding noise doesn’t get things done. I immediately like that it focuses on the status of the actual project and not just a cluttered list of what already happened. But I don’t like that there are tabs that we won’t use and I can’t hide. We won’t use chat. We already use Google Talk. We won’t use this to schedule meetings. We already schedule meetings in Google Calendar. We don’t want to track our time, since we’re not working on billable projects like a freelancer or service consultant does. We already have a different time tracking and expense application that serves our needs. I want individual task management that’s easy for everyone to use, but tied in to a project management “big picture” tool so those in charge of projects can see what’s going on across everyone working on the project in a bird’s eye view. People in charge of the organization can look across all projects. I want to see what has been done and what is remaining across the board without being distracted by the clutter that gets us there. Is that too much to ask? I had high hopes for this one. I like that it’s integrated with Google Apps for calendar, provisioning (through the Google Apps Marketplace). I like how you can customize exactly which features appear on the dashboard. In reality, it’s clunky. In order for a task to appear as an “active to-do” it has to be linked with a task. A task is not the same thing as a to-do, and a to-do is a list (like in Basecamp). Confused yet? My colleagues will be too. The dashboard view has the dreaded “Latest Activity” taking up most of the screen. This is a deal-breaker unless the company tells me I did something wrong: When you add a user to a project, they can create and edit milestones even if they’re not a manager on the project. Here’s a demo user I created and added to a project. Clearly not checked as a manager. I log in as that user and I can freely edit the milestones for the project. I can create new milestones. I can decide who does what, simply because I’m a team member. I can’t delete the milestone, but big deal! This is major no no no no to me. I’ll stop here. There were other tools I looked at/tried. But all along the same lines and my head is spinning and I’m not much closer to deciding which tool we should be using. What am I missing? I’m open to suggestions. I have just read through the list and can sympathize with everyone. I am a researcher and not well organized but have to manage multi-phase projects and the team members are very diverse. We have microsoft project and would like to be able to share outlook calendars to plan meetings and schedule workshops,share large files and update milestons in a user-friendly web-based collaborative software. We have looked at sharepoint and microsoft 365 – and now emp-live and copper, but leaning towards Teamwork PM. Each of us needs to keep up with software in our respective disciplines and waves of emails, etc so we need something that does not have a steep learning curve and I am just learning microsoft project. Any pearls of wisdom would be most welcome. Try Dooster. The customer service are good so they’ll help you with it. I have a recommendation for users to try this product. Hope it works for you too as it has with many other users. The product name is HappyTODOS, a web based project management tool, basically designed to explain three main questions that project managers and executives ponder over most of the time while managing a project. These are: Who is working on what? When task or project will be done? How much does it cost? 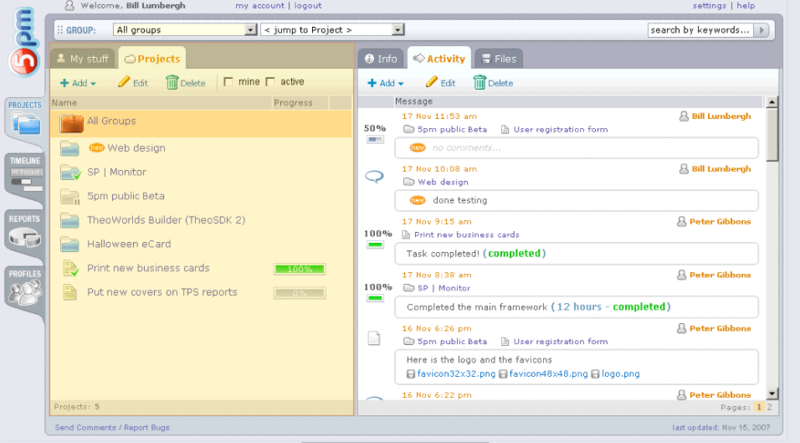 Yes Get Real Time Reports on all these questions while managing your projects with HappyTODOS. Besides it has many more features but above all what is more tricky about it is it lets your projects prioritize according to its needs. This means that when you log in you will see the most important task that you have to complete or work on for the day. This will help you to save time by not making you browse through all your the projects that you have in the list. If you are unsure of what I am saying try it out as there is a 15 day free trial period offer. And if you like it and would love using it for long time, it’s simple to upgrade. Thanks for the great information. I would like to recommend ProjectManager.com. TheBest Way to Manage your Projects. Lets you organize your work, share plans and manage with your colleagues. Dear All. We use Sohnar Traffic. We love it, but it’s useless when it comes to scheduling studio human resources to jobs / projects. It just takes way too much time to keep it up to date and as such is useless to us. However, we find Liquid planner to be AMAZING when it comes to scheduling studio resources. We’re looking to develop an API programme so Traffic can speak to Liquid Planner. If you’re interested in this, please get in touch with me. info@haberdasherylondon.com and we can talk about making this combination of programmes the greatest studio management suite available. Lots to talk about as I have spoken with both Traffic and Liquid Planner about this and already commissioned a developer to begin researching the costs and timeline of creating the programme. Daniel, Glad you love Traffic LIVE, sad you think its not so hot a scheduling. We release every 90 days as you know and R11 a few days ago led to further step changes in scheduling – but we can always do better. Francesco our product manager will call you in a minute, come and see you and see what we can improve.